This is a super cool retro lamp. It works, the switch is a little sensitive, you sometimes need to tap it for lights to turn on. 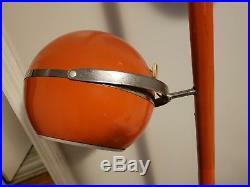 The item "Vintage retro mid century orange tension pole lamp" is in sale since Wednesday, August 1, 2018. This item is in the category "Collectibles\Lamps, Lighting\Lamps\ Electric\Table Lamps". The seller is "accordionsforbrazil" and is located in Wilmington, North Carolina. This item can be shipped to United States, Canada, United Kingdom, Denmark, Romania, Slovakia, Bulgaria, Czech republic, Finland, Hungary, Latvia, Lithuania, Malta, Estonia, Australia, Greece, Portugal, Cyprus, Slovenia, Japan, China, Sweden, South Korea, Indonesia, Taiwan, Thailand, Belgium, France, Hong Kong, Ireland, Netherlands, Poland, Spain, Italy, Germany, Austria, Israel, Mexico, New Zealand, Philippines, Singapore, Switzerland, Norway, Saudi arabia, Ukraine, United arab emirates, Qatar, Kuwait, Bahrain, Croatia, Malaysia, Chile, Colombia, Costa rica, Panama, Trinidad and tobago, Guatemala, Honduras, Jamaica.